As you may recall from last week, Sam finally found out that he was possessed, Gadreel was expelled, and Crowley was set free for his help. Oh, yes, and Dean and Sam had a very melodramatic talk and went their separate ways, etc. The times, they never change. Dean is on the search for Gadreel, but instead he finds himself visited by Crowley. Crowley wants to team up with Sir Winchester to find something called the First Blade, which was used by the archangels to kill the knights of hell. You know, so he can go and kill Abaddon and reclaim his place as the king of hell. Just your average, every day, search and destroy mission. 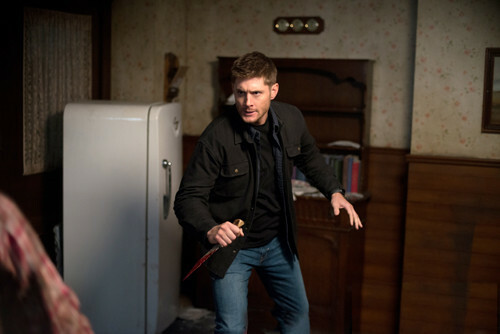 He needs Dean's help for this because apparently back in the day, John and another hunter came upon the blade. Well, not really. They came upon mention of the blade, as they find out thanks to said co-hunter, a buff lady named Tara. Tara kept up the search for said knife of destruction, but was never able to complete the locator spell she found because she needed essence of Kraken. Turns out, Crowley has some of that lying around, so they're able to do the spell, even though Tara is none too pleased to be working with a demon, blah de blah. Don't mess with Dean when he's in fight club mode. The locator spell leads them to a place in Missouri, where apparently Cain has been hanging out all this time. Yes, that Cain, of Cain and Abel fame. He was, I guess, one of the first demons and actually created the knights of hell to begin with, but hasn't been seen in many years. You know, because he fell in love with an understanding lady. But she didn't need to be that understanding, because, yeah, Cain's just all misunderstood. His brother was in talks with Lucifer and would've become his lap dog or something, so Cain made a deal with him instead to send Abel to heaven and Cain to hell. So misunderstood. Parallels to the Winchesters, too, it would seem. Cain, however, refuses to help Dean and Crowley in their mission to find the first blade. Some other demons show up and Dean has to kill some while Cain watches, which is all some kind of test to see if he's really worthy of the blade and, apparently, the actual mark of Cain. Yes, Cain transfers his physical branded mark to Dean, which I guess makes him able to wield the blade or some such? I don't know. It will also come with some sort of consequences, so we'll see just what those may be. He does finally tell them that he hid the blade at the bottom of the ocean, so Crowley goes off to get it. Dean gets a bit huffy with him before that because Crowley was being nefarious as usual and knew who Cain was and what his past was with Abaddon and all that. Yeah, Cain went to kill Abaddon once before, but she was possessing his lady, so he hesitated and ended up just killing the girl instead. Sob story, etc and so on. Dean promises to kill Crowley once he gets rid of Abaddon, but I'm not sure this show can survive anymore without a dose of Crowley wit every now and then. Things never go well when huge needles are involved. Meanwhile, back at the ranch, er, the bunker, Men of Letters place, Castiel and Sam are having some bro time. 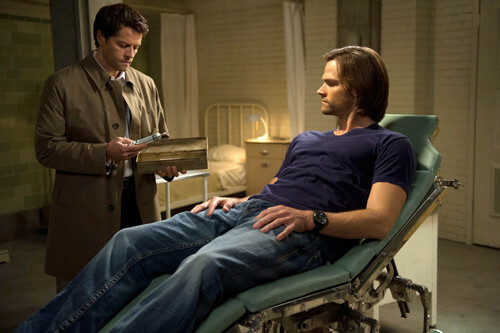 Cas is intermittently healing Sam up to fighting strength and trying to teach him some life lessons along the way. Like, you know, maybe he should reconcile with Dean. He notices that Sam has some kind of angel residue still inside him while doing one of his ritual healings, and this leads them to find a spell of some kind that would possibly help them find Gadreel. You see, apparently when an angel leaves a body it was inhabiting, it leaves a bit of its grace behind, and you can extract is quite simply by sticking a giant needle in said body's neck. Sam, of course, says to go ahead and extract away. Cas does it for a while, but when it starts to make Sam regress to the state he was in before Gadreel possessed him, he stops, because human lives are important and Sam should want to live, damn it. He extracts some of the grace but they aren't able to find Gadreel. Wah wah. Bit of a waste plotline, really just more of some bonding time for Cas and Sam. - I guess the big question here is what is the mark of Cain going to mean for Dean? It's funny because I was just saying the other day how they always give Sam these possessions and demon-y magic things, but hardly ever Dean, so maybe he's finally getting something like that. Guess we'll see. - The Cas/Sam hug was really awkward. Like, kind of a random hug, Sam. I guess you're thanking Cas for making you see that you should want to live? Okay. Sure. 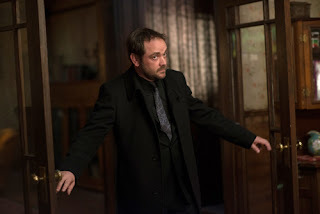 - Something about Crowley makes you want to trust him, but he always seems to have some nefarious plan up his sleeve. 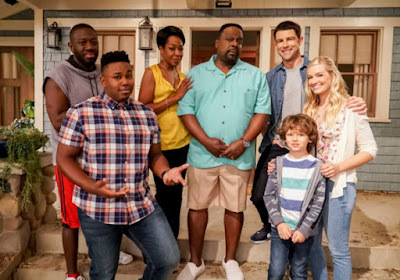 - Honestly a lot of the stuff happening lately feels like someone went "hey, what if this!" and because it sounds kind of cool, they just go with it. Suddenly Cain is in the mix? Suddenly we're able to extract graces from humans? - It was fun to see Timothy Omundson as Cain, though. I love me some Psych! Dean: You wanna hunt. With me. Crowley: I do love a good buddy comedy. Crowley: You're gonna play hard to get? We have time for a montage? Crowley: Didn't they teach note-taking at Hunters Hogwarts? Castiel: You have a guinea pig? Where? Sam: Me, Cas. I'm the guinea pig. Crowley: Your problem, mate, is nobody hates you more than you do. Believe me, I've tried.